This is a general overview on how to use AC Transit. More detailed information can be found throughout the AC Transit website. LOCAL FARE: Single ride fares are discounted for Clipper users: $2.25 – Adults; $1.10 – Youth, Senior, Disabled. TRANSBAY: Transbay Single Ride – $5.50 – Adults; $2.75 – Youth, Senior, Disabled. For complete information on fares and passes, please visit the Fares page. Clipper is the Bay Area’s reloadable card for paying transit fares. To find out why you should get a Clipper card or how and where to get a card, or load a pass or cash value, click here. Find a retail location near you to load Clipper value and/or purchase RTC Monthly Pass stickers. Use the Trip Planner on the AC Transit home page to plan a trip using one or more transit agencies, get walking directions and maps, and see nearby routes and services. Regional service announcements, transit schedules, and real-time departure information are also available at 511.org. If you know the line you want to ride, you can find the stop closest to you with this comprehensive list of stops by line. There are a number of other tools available to help you plan your trip. Click here to see your other options on planning your trip online or over the phone. Current maps and schedules can be found online at actransit.org/maps or as printed timetables and system maps available onboard buses; at the AC Transit & Clipper Customer Service Center; or by request. The timetable and map below are examples only and may not be current. Timetables show scheduled departure times for specific stops on a route called timepoints. Not all stops for a particular route are shown, but can be found here. Departure times for stops between the timepoints are approximate and can be estimated based on the timepoints before and after that stop. Just find the timepoint closest to (but just before) where you are starting your trip. Read down the column under the time point to find the time you need to be at the bus stop. Read across from the right from your starting time to find your arrival time, using the closest time point to where you are going. Timetable line maps are simplified representations of a particular route. They are designed to be used in conjunction with the system map. Although not all streets or details are shown, they do show major streets; landmarks; and transfer points near adjacent lines. 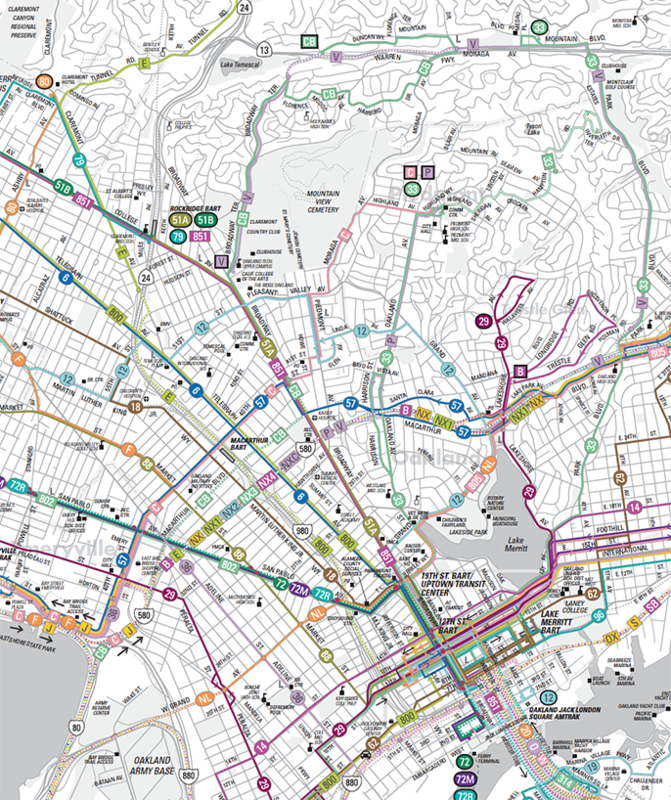 AC Transit’s system map depicts all of AC Transit’s service except for supplementary school service. For information on supplementary school service refer to the appropriate line map. 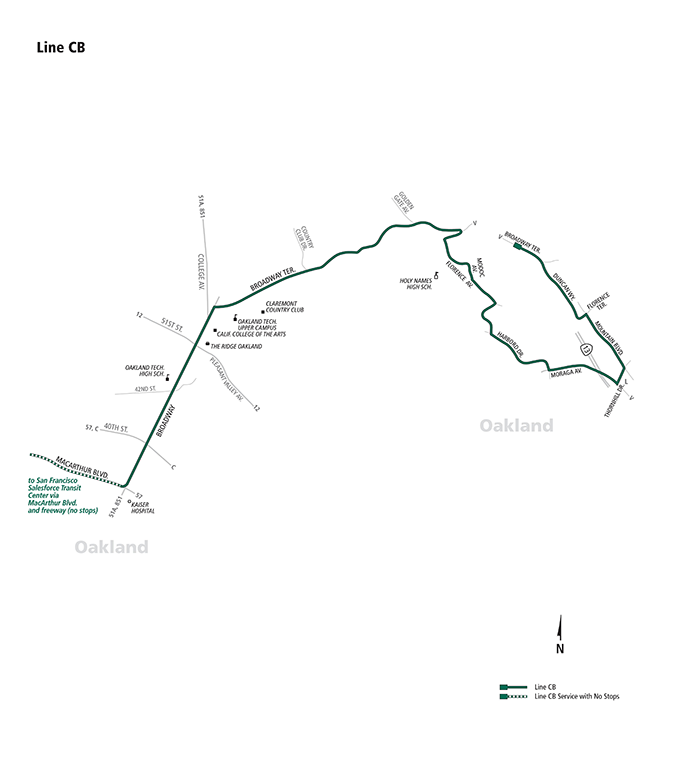 The system map features major streets and landmarks and shows how AC Transit’s service connects. The printed system map is divided into two maps, one representing service from the city of San Pablo to Oakland and the other with service from San Leandro to Fremont. The back of each system map has a frequency guide for the lines covered on the map. The frequency guide is a quick reference to determine when certain lines operate and how frequently there is service. Call (510) 891-4777 to speak with a customer service representative, Monday-Friday 6 am – 7 pm, Saturday-Sunday 9 am – 5 pm. Or you can send a text to DOTORG. Their number is 368674. (For example, if your Stop ID # is 13057, you would text “511 13057″ to 368674. Though 511 does not charge for texting, standard message and data rates by your phone carrier may apply for sending and/or receiving text messages. Bus stops are usually marked by a metal sign, called a bus stop flag, attached to a pole. Occasionally, the flag is attached to a light post or other street fixture when a standalone pole cannot be installed. 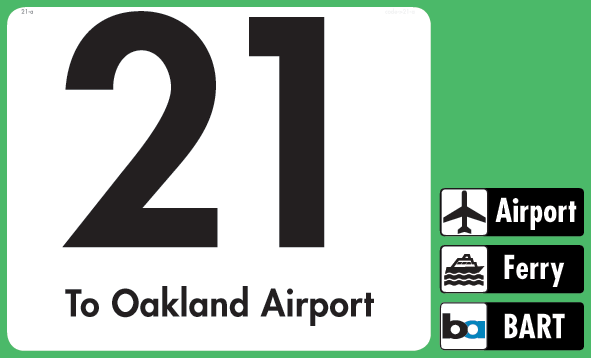 Bus stop flags feature the AC Transit logo, either the older winged logo or the current logo, along with the line numbers or letters of the bus lines that serve the stop. On some newer flags, there is additional information. Underneath each line number, the destination or additional information about that particular line is given. To the right of the line number, transit connections along the route are also represented. And on many flags, old and new, there is a stop ID number. See Real-Time Departures Information above on how to use the stop ID number. Most bus lines have stops every few blocks. Make sure you are on the correct side of the street for your direction of travel. It’s a good idea to get to the stop a few minutes before the bus is expected. Wait for the bus as close as possible to the bus stop pole to make it easier for the driver to see you. You don’t have to signal the bus, but doing so will help make sure the driver doesn’t miss you by mistake. When the bus arrives, check the line number or letter to make sure it’s the bus you want. If you see anything wrong with a bus stop flag, please report it to signs@actransit.org. At over a third of the bus stops in the district, there is schedule information at the stop. The schedule information can be found either on the pole itself or in a shelter adjacent to the pole. The schedule information provides either scheduled departure times for lines at that stop or approximate departure times. Make sure to read the appropriate schedule for the line and day of week you are traveling. Many lines have different schedules on weekdays and weekends. 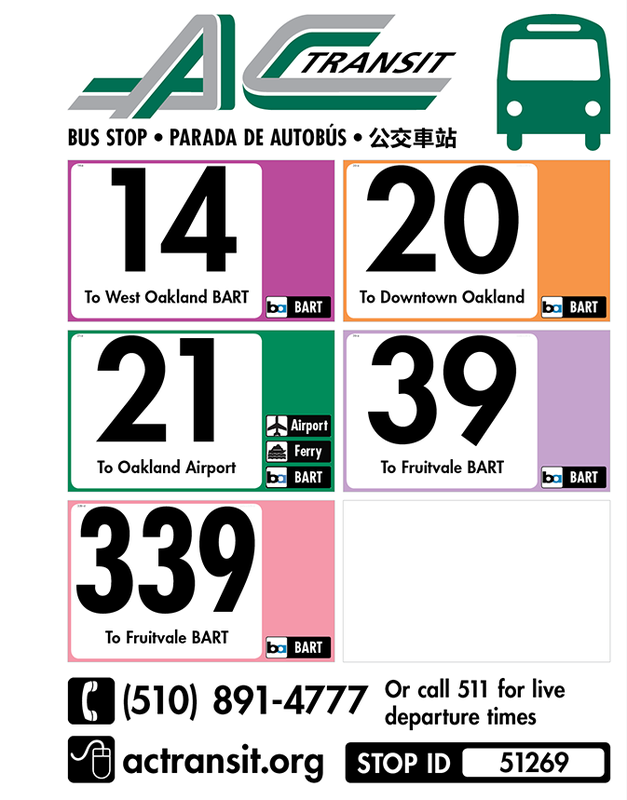 If you see anything wrong with the schedule information at a bus stop, please report it to signs@actransit.org. Due to poor lighting or other environmental factors, visibility at some bus stops is limited. Be seen and avoid pass-ups. Make yourself more visible to AC Transit operators by wearing bright and reflective clothing and use safety lights (flashlights, bike lights, smart phone screens, etc.) if you have them. All AC Transit buses can kneel to facilitate boarding. If you need assistance boarding, ask the operator to kneel the bus. If you have a stroller, cart, or are using a wheelchair/mobility aid, you can request the ramp or passenger lift to help you board. Please have your payment ready to make boarding faster. If you’re paying with Clipper and are boarding a transbay bus for local service, make sure you tell the driver before you tag your Clipper card. Please be aware that all buses have priority seating areas for seniors and persons with disabilities. Non-disabled riders must vacate these seats when needed. If there aren’t any seats available and you’re able to stand for the ride, hold onto the stanchions and handrails as the bus may stop abruptly. Request your stop at least a block ahead by pulling the cord, pressing the button on the pole, or pressing the button above your head (on the green, commuter-style buses). The “Stop Requested” sign will light up. If you are not sure when your stop is coming up, ask the operator to let you know. Leave the bus through the rear doors whenever possible. Wait for the green light before pushing the door open (on buses with manually operated doors) or pressing the door-open button found on the pole next to the door. Priority seating near the front of buses for persons with disabilities and seniors and marked with signs above or near the seats. You may ask the operator to remind non-disabled passengers to vacate a seat for you. Two wheelchair securement areas are provided on each bus. Using the securement devices is required and the operator will assist you. A personalized wheelchair marking/tether strap program is also available for identifying/providing proper securement points on wheelchairs. Call (510) 891-7113 to schedule an appointment. Stop announcements at major intersections and transfer points provided either verbally by drivers or by automated equipment. Make sure the driver sees you before stepping in front of the bus. Driver cannot provide assistance in loading. Squeeze and pull up on the rack handle to release it. Lower the rack until it clicks into place. Use the inside slot first. Two bikes will face in opposite directions. Lift your bike onto the rack, fitting the wheels into their respective slots. Pull out and raise the support arm over the top of the front tire as high up as possible. In addition, the MCIs (the big, green commuter coaches) have cargo bays in which bikes can be loaded. Do not open these bay doors. Instead, alert the driver who will open the cargo bays for you. AC Transit is not responsible for loss or damage to bikes. Bicycles are allowed inside buses between midnight and 5:30 a.m. weekdays and between midnight and 9 a.m. weekends and holidays, if the rack is full and there is room inside. Exception: Bicycles are never allowed inside MCIs (the big, green commuter coaches). When boarding and alighting with a stroller, the passenger has the option of leaving the child in the stroller. If a passenger requests it, the driver will operate the lift to allow the passenger with a stroller to board more easily. Drivers are not to assist with baby strollers. While on-board, the child may remain in the stroller provided that the passenger maintains control of the stroller at all times, keeping at least one hand on the stroller while the bus is moving and the stroller doesn’t pose a safety hazard to any passenger. In no case is the stroller to be allowed to remain in a position which blocks aisles, doors, steps or emergency exits. The brakes should be set so that the baby stroller will be secured and prevented from rolling and becoming a safety hazard. Service animals, leashed, on a lead, or otherwise under the physical control and supervision of the owner at all times, and accompanying people with disabilities, are always allowed on AC Transit buses. A service animal is any animal that is individually trained to provide assistance to a person with a disability. Pets can be brought on AC Transit buses in a container secure and small enough to fit on the owner’s lap. The animal must not be a danger or annoyance to other passengers. The passenger is responsible for any damage or injuries caused by their animal while on the bus. If any animal misbehaves, the passenger will be instructed to remove the animal from the bus at the sole discretion of the operator. It is against state law to evade payment of bus fare or misuse transfers, passes, or tickets to avoid fare payment. Doing so is punishable by a fine of up to $250 (California Penal Code Section 640). California Penal Code Section 640 prohibits smoking; eating or drinking; and loud disturbances aboard a bus. Assaulting a transit passenger or operator is a crime punishable by imprisonment, a fine of up to $10,000, or both (California Penal Code Section 243.3). AC Transit will prosecute all incidents to the full extent of the law. Federal law requires that priority seats be made available to persons with disabilities and seniors. No smoking at bus stops in most cities or on buses. Don’t threaten or intimidate riders or operators. It’s unlawful to threaten the safety of a rider or operator, or interfere with the movement of a bus. Don’t be so loud that you disturb others. Everyone deserves a comfortable ride. Excessive noise is not allowed on AC Transit. Don’t block the aisles or doors. If you have a bag, stroller, or cart, make sure it’s not blocking the aisle or doorway. Keep food and drinks in closed containers. Eating is not allowed on AC Transit, but you can bring food and drinks on board in closed containers. AC Transit is committed to ensuring that no person is excluded from participation in, or denied the benefits of, its services on the basis of race, color, or national origin as protected by Title VI of the Civil Rights Act. For more information on AC Transit’s civil rights programs and the procedures to file a complaint, please check this civil rights webpage. TDD 711 through the California Relay Service. Hours: Monday through Friday, 7:00am to 7:00pm; Saturday and Sunday, 9 am to 5pm. Closed New Year’s Day; Memorial Day; Independence Day; Labor Day; Thanksgiving Day; and Christmas Day. You can always access information through AC Transit’s website or through 511.org. To report a particular incident via the web, use our Customer Feedback Form. Sign up for eNews to receive updates via email on service disruptions or changes. Or follow us on Facebook or Twitter for updates.